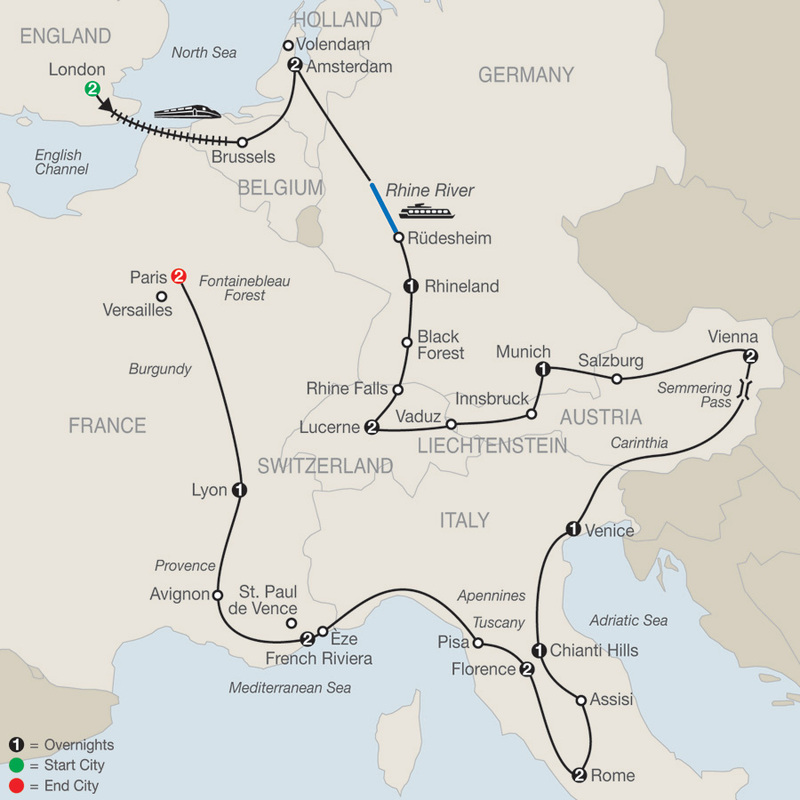 High-speed Eurostar train; motorcoach; canal cruise in Amsterdam; Rhine River cruise; private boat ride in Venice; Seine River cruise in Paris. 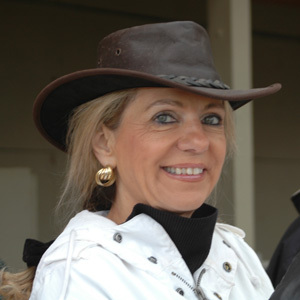 Free Wi-Fi available on your motorcoach and in most hotel lobbies. 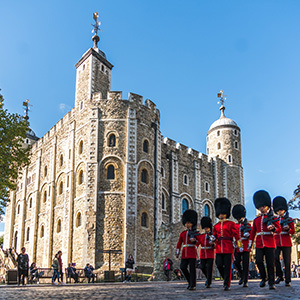 Morning sightseeing with a Local Guide includes all the famous landmarks: the Houses of Parliament and Big Ben beside the Thames River, Westminster Abbey, Whitehall’s mounted horseguards and the Prime Minister’s Downing Street residence, Piccadilly Circus, and Buckingham Palace. 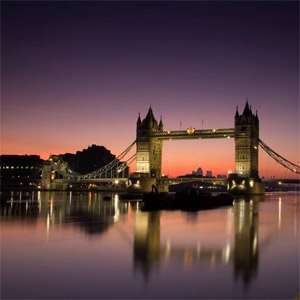 Visit ST. PAUL’S CATHEDRAL, Sir Christopher Wren’s masterpiece built between 1675 and 1708. Meet your Tour Director and traveling companions and transfer by high-speed EUROSTAR TRAIN to Brussels and motorcoach to Amsterdam, where a welcome dinner awaits at your hotel. Meet your Local Guide and hear about the fascinating history of the 700-year-old capital during a leisurely CANAL CRUISE. Admire the patrician mansions and the gabled façades; the “Golden Bend,” the most prestigious part of the Herengracht and a monument to the Golden Age; the Stopera, Amsterdam’s proud concert hall; the Hermitage, a branch museum of the Hermitage Museum of St. Petersburg; and much more. Also visit a major DIAMOND CENTER. 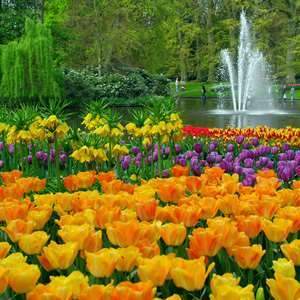 For those who wish to experience Dutch life in the countryside, an optional excursion is available to picture-book Volendam, a fishing village at the former Zuiderzee, including visits to a working windmill, a clogmaker, a cheese farm, and dinner. Via the Dutch region best known as the setting of A Bridge Too Far, enter Germany and the Rhine Valley, where a romantic RHINE CRUISE past castle-crested cliffs, terraced vineyards, and half-timbered towns awaits. A true highlight is a WINE TASTING at Breuer’s Rüdesheimer Schloss in the capital of the Riesling wine country, followed by dinner with local specialties, before going to your hotel. Stop in the BLACK FOREST, renowned for its cuckoo clocks. Hear about the art of WOODCARVING from a local woodcarver, and enjoy a taste of the traditional fruit wine. 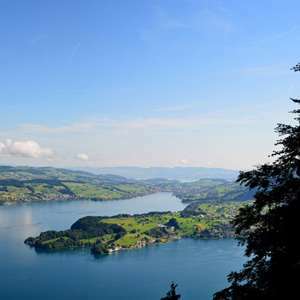 On the Swiss border, take photos of the thundering RHINE FALLS, and continue to picturesque Lucerne. This evening, you may wish to sign up for a folklore party, complete with yodeling and alphorn blowing. During your walking tour, admire the LION MONUMENT, dedicated to the fallen Swiss Guards who protected the Royal House of France during the French Revolution. Cross the famous covered CHAPEL BRIDGE to the Jesuit Church. Afterwards, shop for Swiss watches, knives, or chocolate. 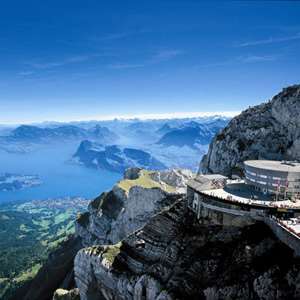 Why not join an optional excursion to Mount Pilatus? Stop in Vaduz, capital of the pocket-sized Principality of Liechtenstein, before entering Austria for a spectacular drive through the Tyrolean Alps to Innsbruck, capital of Tyrol. Walk through its quaint streets and take pictures of Emperor Maximilian’s GOLDEN ROOF before continuing to Munich. Visit MARIENPLATZ with its Old and New Town Halls. You may wish to try a Stein of beer at the famous Hofbräuhaus, Munich’s most famous beer hall, dating back to 1589. Arrive in Salzburg and follow your Local Guide for a pleasant stroll through the historic center. Admire exquisite MIRABELL GARDENS, the Great Festival Hall, St. Peter’s Monastery, and magnificent RESIDENZ SQUARE, where some scenes of The Sound of Music movie were filmed. 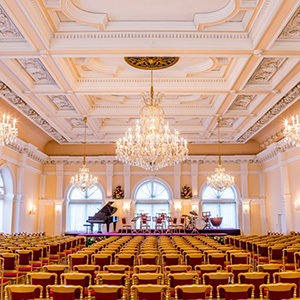 See Mozart’s birthplace in the charming Getreidegasse and browse through the downtown market. Next, pass the lovely Salzkammergut Lake District, also famous from the same movie, and along the Danube Valley to Vienna, proud capital of Austria. 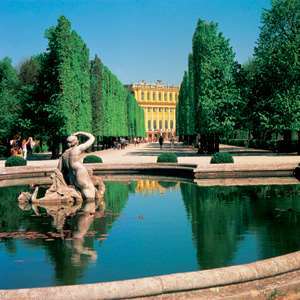 Guided sightseeing features a drive along the Ringstrasse with its magnificent buildings like the Vienna State Opera; and a stop at the Hofburg Palace, winter residence of the Austrian Imperial family. Marvel at the impressive courtyards, famous HELDENPLATZ, and awesome ST. STEPHEN’S CATHEDRAL. Time to savor Sachertorte and watch the jolly crowd in one of Vienna’s famous coffee houses, or choose from our optional excursion possibilities. Journey across scenic Semmering Pass and through the loveliest parts of Austria to Italy and the Adriatic Sea. Arrive in Venice, a powerful magnet for romantics and art lovers from all over the globe. You may wish to join an optional evening featuring an exciting water-taxi ride along the Grand Canal, followed by a Venetian dinner. 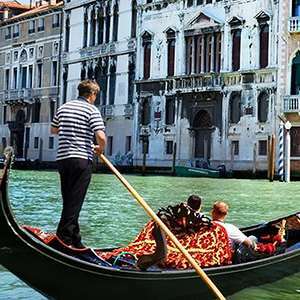 Enter Venice in style by PRIVATE BOAT to ST. MARK’S SQUARE and admire the byzantine basilica, lavish Doges’ Palace with its Bridge of Sighs, and watch skilled GLASSBLOWERS fashion their delicate objects. Why not join an optional gondola ride? Look forward to a memorable overnight stay in the breathtaking Chianti Hills, surrounded by vineyards, olive groves, and charming stone villages, and enjoy a traditional dinner with local wine. Guided sightseeing starts with a visit to the VATICAN MUSEUMS and SISTINE CHAPEL with Michelangelo’s ceiling paintings and The Last Judgment, followed by a visit to monumental ST. PETER’S SQUARE and BASILICA to admire Michelangelo’s Pietà. Then, enjoy views of other major sites as you drive to the Roman Forum to visit the amazing COLOSSEUM, where gladiators once fought. 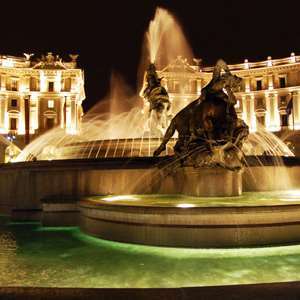 For those who wish to see it all, an optional walking tour with a Local Guide is available to further explore famous sites, like the Spanish Steps, Trevi Fountain, the Pantheon, and more. An easy morning drive to Florence, “Cradle of the Renaissance.” Meet your Local Guide, and visit the ACADEMY OF FINE ARTS with Michelangelo’s celebrated David. 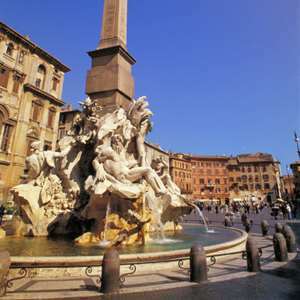 Continue your walking tour through the historic center and stand in awe in front of the magnificent cathedral, admire Giotto’s Bell Tower, the Baptistry’s heavy bronze “Gates of Paradise,” and sculpture-studded SIGNORIA SQUARE. Later, enjoy a tasty pizza at the Finisterrae restaurant. Time to explore this fascinating city at your own pace. Later, to further discover Tuscany, an optional excursion to the medieval town of San Gimignano, including dinner, is available. In Pisa, marvel at its amazing Leaning Tower. Next, enjoy spectacular views driving along the Italian and French Rivieras. 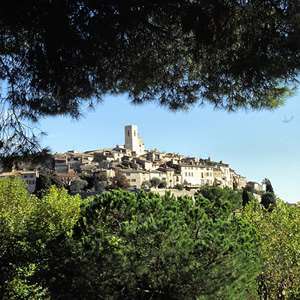 Leave the highway for the panoramic Moyenne Corniche and visit one of the PERFUME FACTORIES for which the area is famous. 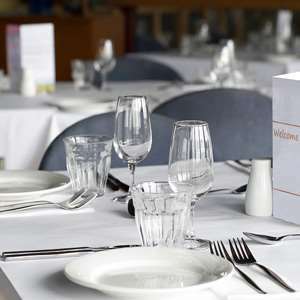 This evening, you might choose to sample some French cuisine. A leisurely day on France’s most popular coast. 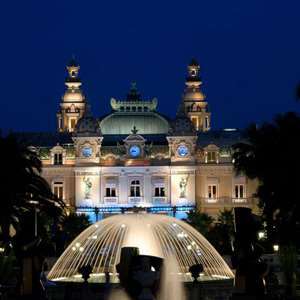 To make the most of your stay, exciting optional excursions are available to the picturesque artist village of St. Paul de Vence and to Monte Carlo. Stop in Avignon, the medieval residence of several popes and antipopes. Walk through the OLD TOWN, and admire Pont d’Avignon, the bridge of the popular song, and the magnificent Palace of the Popes. Time to browse through the many shops for traditional Provencal products. Arrive in Lyon, capital of the Gauls during Roman times. Drive past the Burgundy vineyards and Fontainebleau Forest to Paris, the traditional climax of a European vacation. Sightseeing with a Local Guide includes the Opéra, Arc de Triomphe, Champs-Elysées, and a relaxing SEINE CRUISE with spectacular views of Notre Dame Cathedral and the Eiffel Tower. 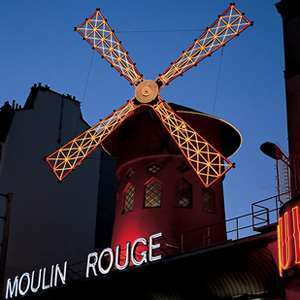 Tonight, dinner and show at the famous Moulin Rouge might just be the ticket! 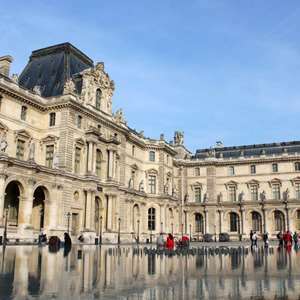 A full day at leisure offers you the possibility to join optional excursions to the magnificent Palace of Versailles and the famous Louvre Museum with the Mona Lisa. Tonight, further explore Montmartre, Paris’ renowned art district, where a farewell dinner has been prepared at a local restaurant, the proper way to say au revoir, Paris. 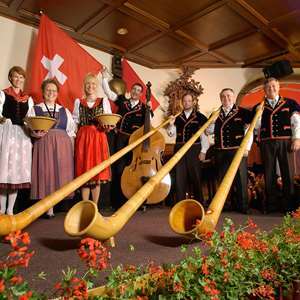 Raise a glass and toast an unforgettable evening of traditional entertainment during this excursion featuring a 3-course feast of local specialties, alphorns, yodeling, and festive Swiss music and dancing. Enjoy a traditional Austrian Dinner with drinks at a typical restaurant or at one of the famous Heurigen. 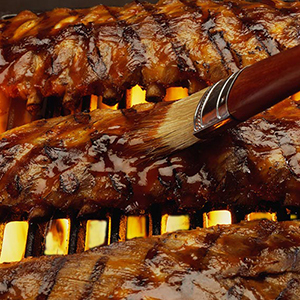 Enjoy a typical Austrian dinner. 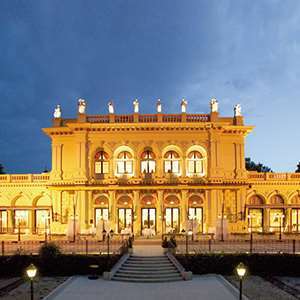 Experience what Vienna is best known for, as you enjoy a typical Austrian Dinner followed by a concert in one of its beautiful venues.